As many folks know, I go by the handle of ‘thomo_the_lost’ when I need a username on a website as it tends to fit my lifestyle of a year or two here, a year or two there. I have even used that handle on the odd financial services website without any issues. 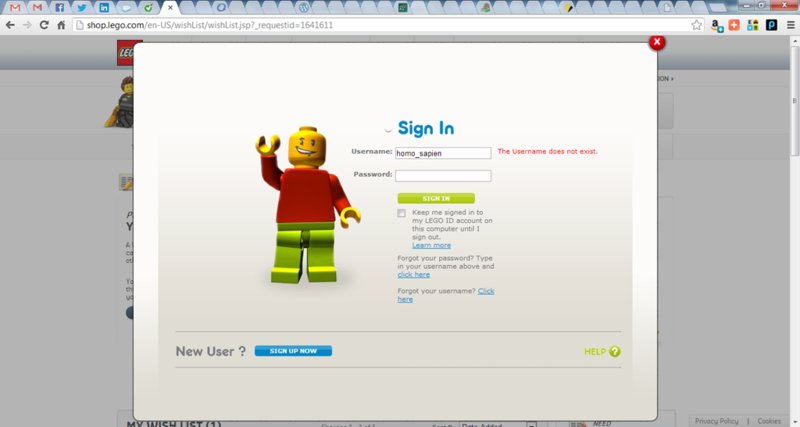 However, when trying to join the Lego website (don’t ask why), I was told I could not use that username, even though no one else was using it. Normally I would not care about that and just change it but this happened to me earlier in Facebook as well. When I tried to use ‘thomo_the_lost’ for my Facebook homepage, Facebook rejected it even though it was not used anywhere else. In both cases (Lego and Facebook), if I changed my username to ‘thommo_the_lost’ then it worked fine. What is the difference between the two handles? One ‘m’ only. The words and sounds are still the same. So why does one reject and not the other? Simple really (although it took me nearly 60 seconds to work it out). ‘Thomo’ has the string ‘homo’ in it. To test that this is indeed the reason, I tried to set a username of ‘homo_sapien’. I thought, “that’s a good scientific name for a person”. Guess what? That failed too. Just to confirm my suspicions and to make sure that I was being fair to Lego before writing this, I tried to login as ‘homo_sapien’ and then clicked on the ‘I forgot my password’ link. I figured that if ‘homo_sapien’ was already used as a username I would be able to see it from the return screen. 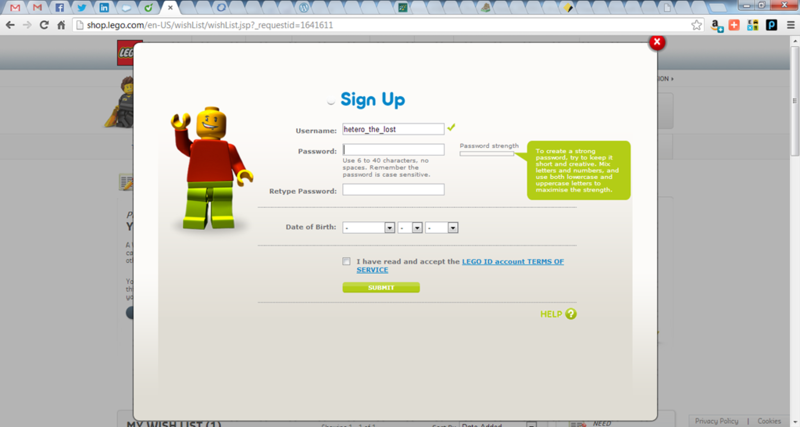 The screen to the right was the response to that – there is no login username of ‘homo_sapien’ in the Lego system. This is the same as Facebook (and I guess a number of other websites as well). The problem is the ‘homo’ string. It seems that these organisations think ‘homo’ is a sexual or indeed homosexual term and that if that string is allowed in usernames, it will be the end of civilisation as we know it! Well, it must be discrimination – I leave you with my last experimental trial on the Lego website – have a close look at this username! In 1848 war broke out between Denmark, Prussia and Sweden over Schleswig, part of the joint Schleswig-Holstein duchies of northern Europe. The main reason for the conflict was nationalism and whether Schleswig should be more closely tied to Denmark than it was with the German population of Schleswig wanting no such thing. As this war was in 1848, it was fought during a transitional period for naval warfare with the wooden walls of the Napoleonic times soon to be replaced with the steel sides of mid to late 19th Century. One of the neat things about researching for this conflict is that it occurred as Australia was starting to develop an identity through the 19th Century and moreover, as Australian newspapers were developing the craft and trade. The National Library of Australia has a beta test project running at the moment where they have digitised many old Australian newspapers, going back to the early 18th Century. Subsequently, as Australians have always been a bit curious about how the other folks live, there was always demand for articles of world news, both from Europe and interestingly, from Asia as well. Danes and Germans, for Schleswig; a collision took place at Flensburg but the result was not known. The Danish government has called on England to assist her against the Germans. Fears were entertained in Hamburg that the Danes would blockade the Elbe except to English vessels. This article came from the The Perth Gazette and Independent Journal of Politics and News, dated Saturday, 12 August 1848, and was one of the pieces brought up with the search mentioned above. This evening the Prussian ships lying at anchor in the roadstead have been laid under embargo by the Danish ships of war. A traveller who is well-known to us and who returned yesterday from Copenhagen, informs us that the feeling in Denmark, although very excited, is by no means so inimical to individual Germans as is generally supposed. He says he travelled through Zealand, and although he always spoke German, he did not meet with the slightest insult, either in the country or in Copenhagen. On his application to the Minister of War for permission to go on board the Dronning Maria, his request was immediately granted in writing, and on his mentioning the name of some Hamburgers with whom he was acquainted, he was not only allowed to speak to them, but was permitted afterwards to send them all that they required-clothing, books, &c. The prisoners were kept in strict discipline, but treated with great mildness. 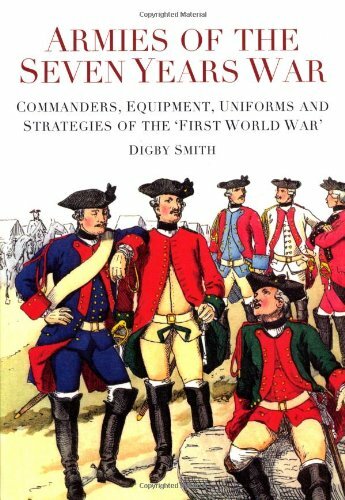 The non-commissioned officers receive 12 pence a-day besides their rations. The major in command on board is a very humane man, and is on very good terms with the prisoners; he even permits them to enjoy themselves in playing at cards-smoking is, of course, prohibited. A private letter from Flensburg positively denies the reports of the bad treatment which the Schleswig-Holstein troops are said to have met with in that city. Both the German and Danish troops are equally well received by the citizens ; few excesses were committed against the Germans on their retreat, and the report that scalding water, &c. was poured upon them was quite without foundation. A miller, who took some Germans under his protection, was seized by the Danes with all his people, but was afterwards liberated. The inhabitants of Flensburg have maintained a decidedly neutral position. The wounded among the Danes and the Germans are tended with equal care, and honourable treatment is given alike to both. Go have a look at the site, research the news from this war as if it was happening now.